One hundred and fifty years ago today, on July 28, 1864, the Union Navy vessels Agawam and Mendota engaged Confederate land forces across Four-Mile Creek near Deep Bottom on the James River. As is often the case for these smaller fights, I don’t have a lot of information. I do have, however, a report from Captain Melancton Smith of the U.S.S. Onondaga on the action at Four-Mile Creek from the Union navy’s point of view. If anyone knows which Confederates were being shelled by the Agawam and Mendota, please leave a comment for me to further research. Keep in mind that this shelling was in support of Winfield Scott Hancock’s First Deep Bottom expedition, then nearing its conclusion north of the James River. On Picket, Below Barricade, James River, July 29, 1864. Sir: I have the honor to report that the Mendota and Agawam were engaged all day on the 28th shelling the enemy across Four Mile Creek, where they had been very busy throwing up works and maneuvering large bodies of men, supposed to be nearly all of Longstreet and Hill’s corps. The enemy made a demonstration on General Foster’s front [at Deep Bottom] and the Agawam opened fire, but with what effect it has not been ascertained. Commander Nichols, of the Mendota, reports that he fired at intervals of seventeen minutes and that General Hancock informed him that his shelling was very effective and of great assistance to his operations. He had the misfortune, however, to disable his after 100-pounder pivot, the rifles being the only guns that would reach the position occupied by the enemy. 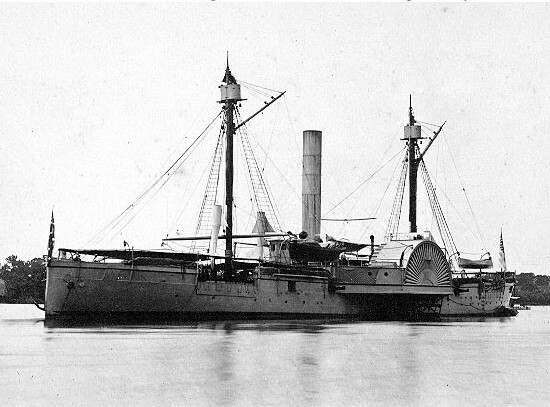 The gun was fractured from the forward edge of the reinforce band on the breech to a point forward of the center of the trunnion, but from the report of Commander Nichols, forwarded this day to the Bureau of Ordnance, the gun was properly served and every ordnance requirement complied with. A confidential communication from General Weitzel, received this afternoon, states that in view of a military movement ordered by General Grant all the troops excepting General Foster’s original command will be moved to-night from Deep Bottom, and requests all the assistance I can render him. All the naval force that can operate to advantage at that point has been sent. Captain and Divisional Officer in James River.